GSM Modules are frequently used in IoT projects since it has the ability to send and receive data remotely. The GSM Modules doesn’t have much dependencies like the Wi-Fi modules. While other wireless modules such Wi-Fi or Zigbee have cons such as short range and cost, the GSM Module have the reliability, long range Since only one SIM card is required with valid plan. Though the GSM modules cannot send a vast amount of data generated by sensors, it is ideal for applications where small reasonable amount of data to be sent. In this tutorial, such GSM module will be interfaced with STM32F103C8 ARM microcontroller to send and receive Text Messages (SMS) from the cellular mobile number configured in the program. To display the messages received and sent, one 16x2 LCD will be used with two Push Buttons which will initiate sending and receiving of text messages after pressing the relative button. What is SIM800C GSM Module? SIM800C is a widely used GSM Module with a serial interface modem which runs in between 3.4V-4.4V Voltage level. SIM800C is a Quad-band GSM/GPRS Module which is used in embedded applications where the remote data transfer is required. SIM800C works on 850/900/1800/1900MHz. It can also receive & transmit Voice Call, SMS with low power consumption. The module is controlled by using AT commands. It supports one SIM card interface and has UART (TX & RX) pins along with one RS232 Serial Protocol that can be used to interface with different microcontrollers in embedded applications. A DC Power adapter of 12V is used to power the SIM800C GSM module. A SIM card is inserted at the back of the SIM800C GSM module. Note that the SIM800C doesn’t support 4G, so do not insert a 4G SIM Card. In order to interface SIM800C with STM32F103C8 microcontroller, the UART Serial port will be used which is a hardware serial interface of the STM32F103C8. The below image indicates the UART pins in STM32F103C8 which are A9 and A10. The STM32F103C8 has three UART interface for connecting three external serial peripherals. The AT-commands will be used to access the functions of GSM Module such as sending and receiving Voice Calls, Text Messages. Some of the AT commands are given below which will be important in this tutorial and will be used frequently. Sends SMS to a particular number here XXXXXXXXXX. When you see “>” start entering the text. Press Ctrl+Z to send the text. Connections for connecting GSM with STM32 is shown in the circuit diagram below. 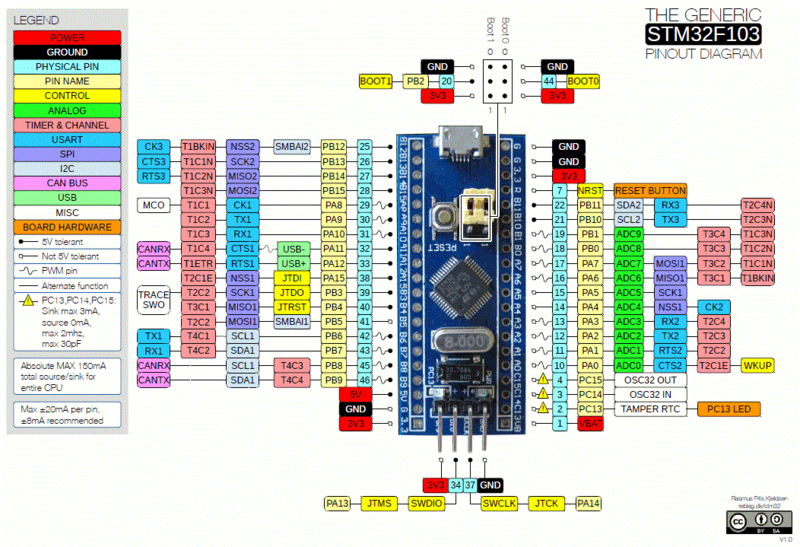 STM32F103C8 microcontroller can be programmed using ARDUINO IDE. In this tutorial, FTDI or ST-LINK programmer is not needed to program the STM32. For uploading code to STM32F103C8, simply plug microUSB port to STM32, and USB port to PC by using USB cable and start writing code in ARDUINO IDE. In case of any doubt follow our previous tutorials on how to program STM32 without using any external FTDI or ST-LINK Programmer. The complete code and the working video can be found at the end of this tutorial. Start with including necessary libraries for peripherals used in this tutorial. Also define the pin configuration of LCD. Next, initialise LCD selecting the function lcd.begin(16,2); where (16,2) tells the LCD type such as 16x2 block LCD display. Just print a message to debug that if LCD is giving Output and interfaced properly. Define the Push button data direction as Input Mode and define the pin number used. Select the baud rate used for serial communication. There are two functions in the code one to send message and other one to receive message. Detailed explanation is given below. This function is used to send SMS to a number. AT command is sent to GSM module indicating the message text mode and on which number the message needs to be sent. The below statement sets the GSM module in the Text Mode by sending AT command (AT+CMGF=1). 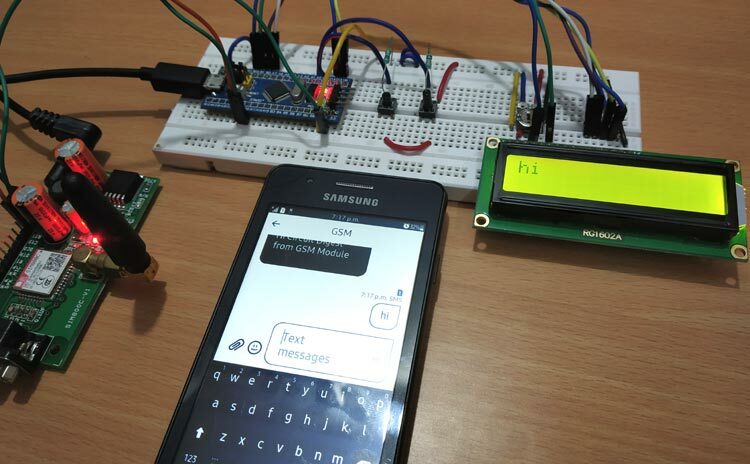 After that AT command (AT+CMGS) indicating send an SMS with the mobile number is sent to GSM module via serial1 port. The messages are sent using AT command after every one second and then CLRL+Z needs to be sent so an ASCII code of CTRL+Z is sent via Serial1 port to GSM module. Then the “SMS sent” is displayed in the 16X2 LCD displayed. In this function, the messages are received and printed in the LCD display screen. So, to receive live messages the above AT command is used. After receiving the SMS, it contains a string available at the serial1 port which also have the other data in it such as the time, date etc. So, after occurrence of the sixth double quote (“) the rest all is the SMS received. Hence the other information is omitted and the remaining information that is the received message is displayed in the 16x2 LCD display. 1. To send Text Message, simply press the Left Push button. The SMS will be sent to the mobile number entered in the code. 2. To receive Text Message, simply press the Right Push button and the SMS will be received and will be displayed in the LCD display screen. So that’s all about interfacing GSM module with STM32F103C8 ARM microcontroller. In case of any doubts or suggestions, please feel free to comment.